Porsche Cayenne, one of the highly anticipated vehicles, which is being sold in both petrol and diesel engine options. This SUV comes in quite a few variants, out of which, Porsche Cayenne S is the entry level petrol variant. It is powered by a 3.6-litre, V6 petrol plant that is capable of unleashing a maximum power of 420bhp along with a commanding torque output of 550Nm. This newest vehicle is blend of advanced technologies like Porsche Traction Management and VarioCam Plus System. The PTM is an active all wheel drive system that comprises of automatic brake differential, anti slip regulation and map controlled multiplate clutch. This system regulates the distribution of drive force between front and rear axles and makes the drive more comfortable. The company has given it a lot of comfort features, which gives the occupants a pleasurable driving experience. Some of them are Porsche Car Connect, which allows you to control certain functions of this SUV remotely with the help of a smartphone, multifunctional sport steering wheel with gear shift pedals, storage compartments, adaptive cruise control with Porsche active safe and so on. It comes incorporated with an advanced 545watt BOSE surround system featuring 14 loud speakers and a 9-channel amplifier. At the same time, it is blessed with advanced safety aspects like engine immobilizer with in-key transponder including two stage locking, remote central locking and Porsche dynamic lighting system featuring bi-xenon lamps. It is competing against the likes of Land Rover Range Rover, Mercedes Benz GL class, BMW X5, Audi Q7 and others in this segment. 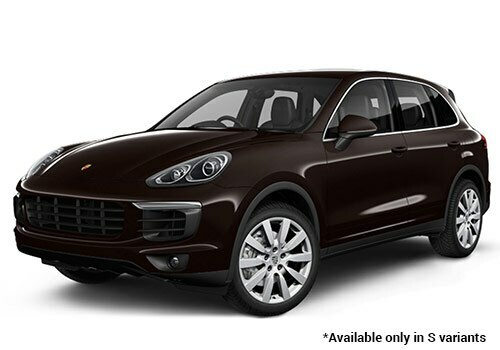 This luxurious sports utility vehicle comes with the Porsche's design language and fitted with a number of trendy cosmetics that gives it a captivating look. To start with the frontage, it has a huge air dam that is fitted on the body colored bumper and provides better air intake and contributes towards improving engine performance. Just above this, there is signature oval shaped headlight cluster that is skillfully equipped with bi-xenon headlamps and turn indicators. Also, it is incorporated with daytime running lights, which further amplifies the front profile. Its bumper is affixed with a black protective cladding along with an aluminum under-body guard, which gives it an aggressive look and also prevents the vehicle from minor damages. The radiator grille is quite aggressive and fitted with a few slats. Its large windscreen is made of heat insulating glass and accompanied by a couple of rain sensing wipers. Coming to its side profile, it has a unique structure owing to its expressive wheel arches and stylish window lining. The flared of wheel arches are fitted with a set of 19-inch lightweight alloy wheels, which are further covered with a set of 235/55 R15 sized tubeless radial tyres. Its window sill surround gets a lot of chrome treatment whereas its ORVM caps and its door handles are in body color. These external wing mirrors are auto foldable and comes with heating and memory functions as well. Its rear end has a stylish taillight cluster that comes incorporated with high intensity LED brake lights and turn indicators. The main highlight of its rear profile is its sporty dual tone bumper that comes fitted with an aluminum protective cladding along with quad tailpipes. This trim is blessed with a plush interior cabin that is done up with a brushed aluminum package, which is further accentuated by silver inserts. This dual tone internal section is further complimented by a lot of wood inserts and ambient lighting. The dashboard has a distinct design with a two tone look and is equipped with several aspects like a storage compartment, infotainment unit, a stylish instrument panel, multifunctional steering wheel and silver accentuated AC vents. It also has a trendy central console that comes equipped with an infotainment system and ergonomically positioned control switches for ease of its driver. The leather wrapped multi-functional steering wheel has three spokes that gets a high-gloss black and silver inserts. It is mounted with audio, call, cruise along with gearshift controls. The individual seats in the cockpit are adjustable in 18-different ways and has a memory function as well. The rear bench seat have 40:20:40 split folding facility, which helps to increase the total boot volume to about 1500 litres that is quite large. On the other hand, this SUV comes loaded with several utility features like front sun visors, inside rear view mirror with anti glare effect, drink holders, room lamps, all four power windows with express up/down function and many other such aspects. Powering this variant with an advanced 3.6-litre, V6 petrol engine that has a displacement capacity of 3604cc. This six cylinder based engine comes with twin turbo-charging units, which allows the motor to unleash a whopping power of about 420bhp at 6000rpm that results in a hammering torque output of 550Nm between just 1350 to 4500rpm. It is mated with an 8-speed Tiptronic S automatic transmission gear box that works in combination with Porsche traction management to distribute torque output to all four wheels. It enables the motor to attain a breathtaking top speed of 259 Kmph. At the same time, it takes about 5.5 seconds to breach a 100 Kmph speed mark from a standstill. On the other hand, it can deliver an average mileage of approximately 11.23 Kmpl, which is rather decent for this segment. Both the front and rear axles have been coupled with a lightweight spring strut type of suspension. Its front and rear wheels are equipped with a set of internally vented and cross drilled brake discs, which are further loaded with four piston aluminum monobloc fixed calipers that enhances its performance. It is also incorporated with an advanced anti lock braking system that collaborates with electronic brake force distribution, anti slip regulation and brake assist system. The company has incorporated the internal cabin with a power steering system with speed related function, which simplifies the handling of this SUV. This high-end luxury vehicle is loaded with several advanced features as standard. It is bestowed with an on-board computer and an advanced instrument cluster featuring 4.8-inch color display that provides information regarding external temperature, gear indication for PDK and several other warning lights. Apart from these, it is equipped with a multi-functional steering wheel with gearshift paddles, non-smoking package, four accessory power sockets and an automatic climate control unit with separate temperature setting for front passenger and driver, Porsche communication management system including a navigation module and a high resolution 7-inch color display. The list of protective aspects include side impact protection beams in doors, three-point automatic seat belts, six airbags, ISOFIX mounting points for child seats, rollover detection for activation of curtain airbags, remote central locking, alarm system and an advanced engine immobilizer. At the same time, its lighting system includes automatic headlight activation including welcoming home lights along with bi-xenon lamps with static and dynamic cornering function. 1. Cost of maintenance and spares are too high. 2. Porsche Active Suspension Management system can be given as standard. పోర్స్చే కయేన్ 10 వేర్వేరు రంగులలో అందుబాటులో ఉంది - Jet Black Metallic, White, Rhodium Silver Metallic, Quartz Grey Metallic, Palladium Metallic, Moonlight Blue Metallic, Carrara White, Mahogany Metallic, Black, Biskaya Blue Metallic.